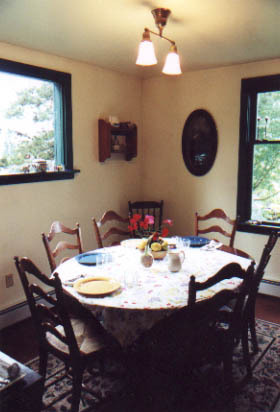 Breakfast at the Oscar Gill House is served family-style in our dining room. 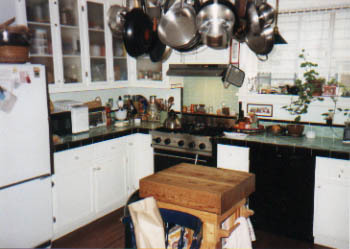 Typical fare often features egg and chile casseroles, blueberry pancakes, sourdough french toast or smoked salmon quiche. Though we try to accommodate the needs of guests on special diets, this may not always be possible. Fresh fruit and wholesome grains are always available. Proof in warm place overnight (covered) in glass or crockery bowl. A few minutes before preparation, sprinkle soda & sugar mixture over batter and fold in. Let rest a couple of minutes. Pour onto a hot griddle in small pancakes and drop fresh or thawed and drained blueberries onto pancakes. Flip when bubbles form. Serve with whipped butter, maple syrup or homemade fruit jam.